The Fulton Area Council of Christian Churches is sponsoring its 26th CROP Walk on October 14. 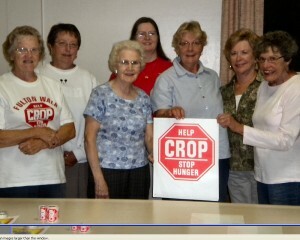 The Fulton CROP Walk Recruiter’s Rally was held recently in preparation for the 26th CROP Walk in Fulton.From left are Lois Mirabito, Sharon Foster, Faye Bedau, Kathy DeMott, Martha Swick,Carole Lescarbeau and Nancy Allen. This Church World Service program is a relief, development, and refugee assistance ministry of 36 Protestant, Orthodox and Anglican denominations and has partnerships in more than 80 countries. Its mission puts faith into action by serving those in immediate need and by addressing the root cause of their suffering – poverty and injustice. greater Fulton community and other communities which host a walk, to become personally involved in responding to needs locally and throughout the nation and world. “Ending Hunger One Step at a Time” is the message we share as we walk to raise monies for those who walk each day, for clean water and food for their families. The walk will begin with registration at 1 pm the day of the walk at the Fulton Municipal Building on South First Street. Walkers will have a choice of two walks: the Golden Mile or 5 K….both of which will be entirely on the east side of Fulton. food pantries, Believer’s Chapel, Os. Co. Catholic Charities, Dexterville Community Services and Salvation Army. Anyone in the community who would like to participate or wants more information is encouraged to contact their local church recruiter or Lois Mirabito at 593-2731.